In our continuing saga of The Home Depot offenses submitted by serious lowercase L contributor, Rimpy, we bring you this box, found in the receiving area of Rimpy's Home Depot, scheduled for TRANSFER to REDBlUFF. 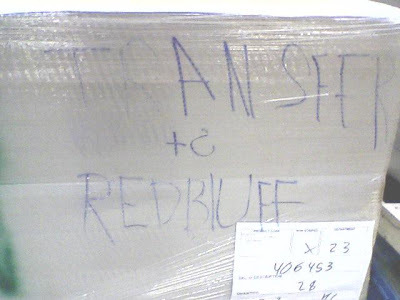 Unfortunately, it may never make it there, considering Red Bluff should be two words, and, like the T and R in TRANSFER, the rest of the letters will probably wipe off the clear tape wrap. In this instance, I think the author probably wrote REDBUFF without an L, and squeezed in the lowercase L as an afterthought. there's no way in hell this package is getting to red bluff.